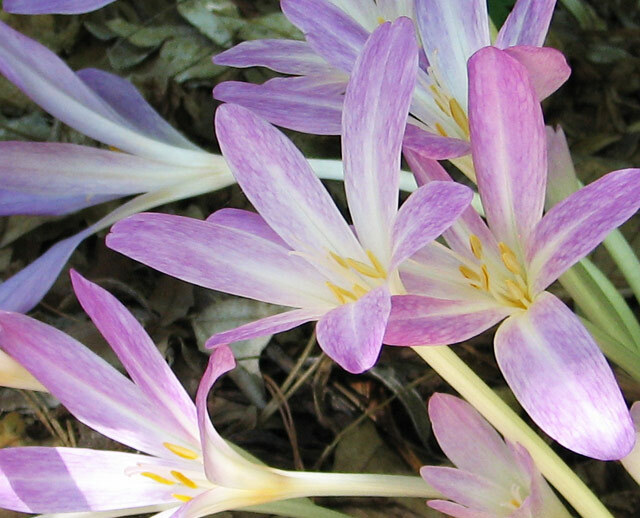 Colchicum species A through H are found on this wiki page. 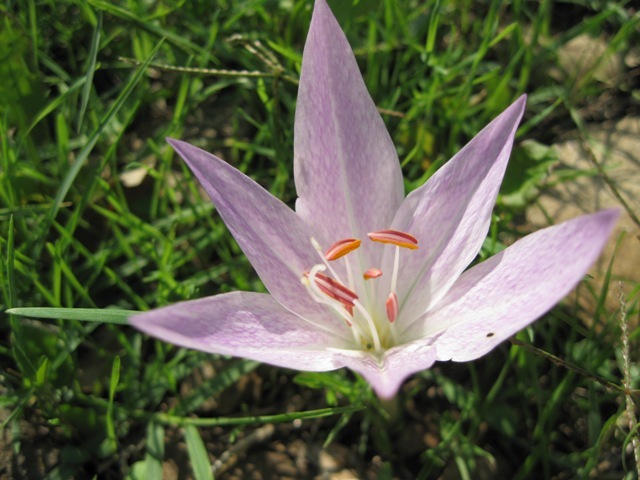 Colchicum antilibanoticum is a species native to Israel. 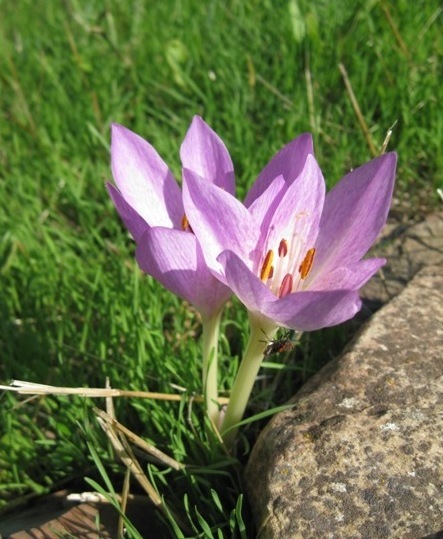 Photo by Gideon Pisanty. 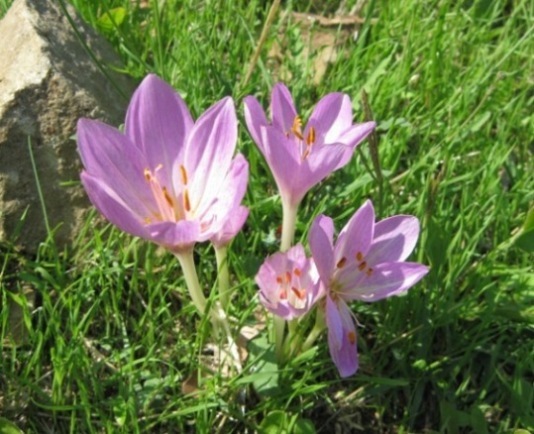 Colchicum autumnale is an early fall blooming species with small pink-purplish flowers that is a common meadow plant in Europe. 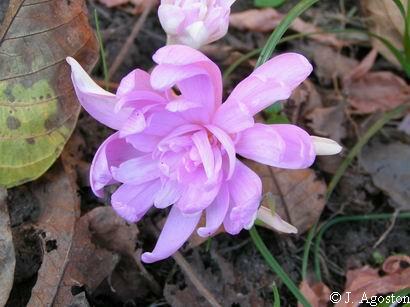 Photo 1 was taken by John Lonsdale. 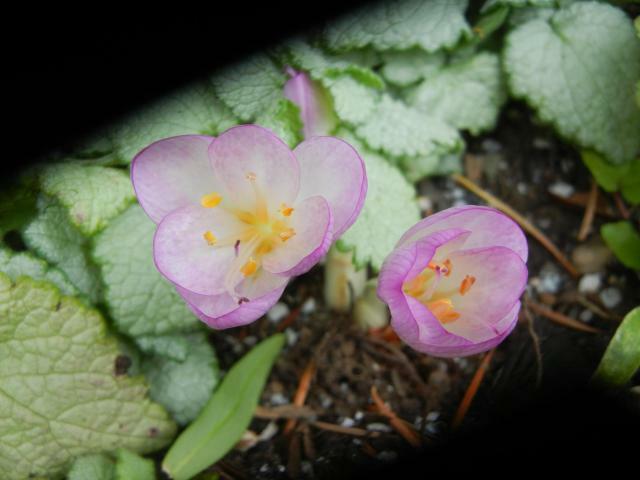 Photos 2-4 were taken by Nhu Nguyen at the UC Botanical Garden. 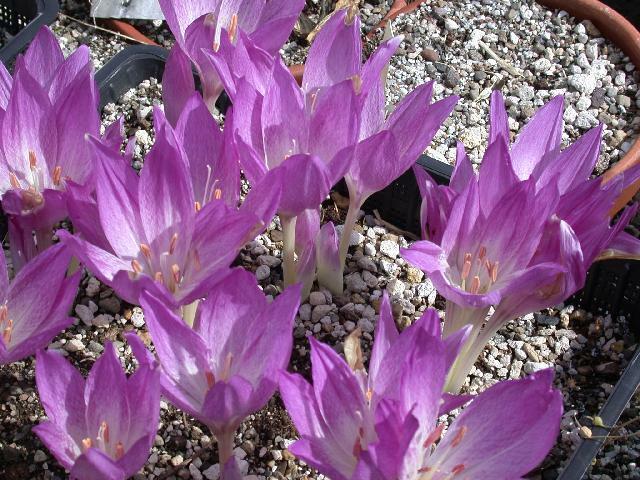 Colchicum baytopiorum from Turkey where it is found in rocky scrub has purplish-pink non-tessellated flowers. 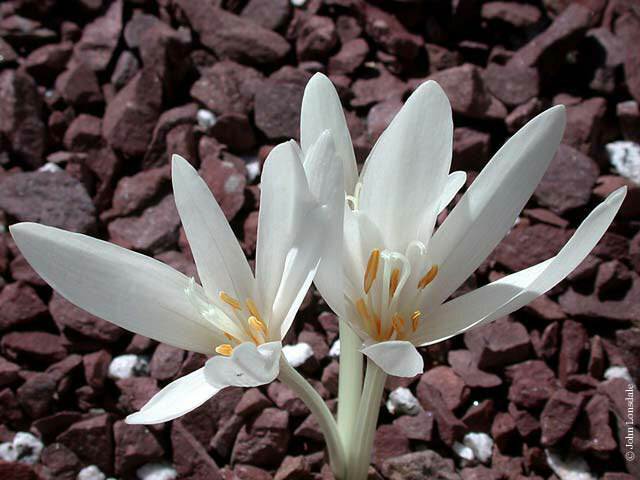 Photos by Arnold Trachtenberg. 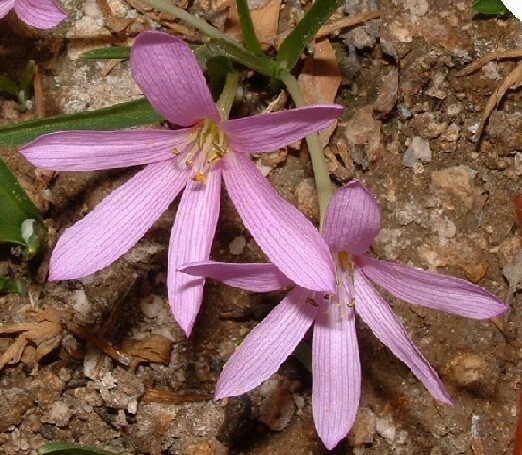 The last photo by Jane McGary was taken in the wild, showing this species growing in the Roman-era ruins of Termessos near Antalya, southwestern Turkey. 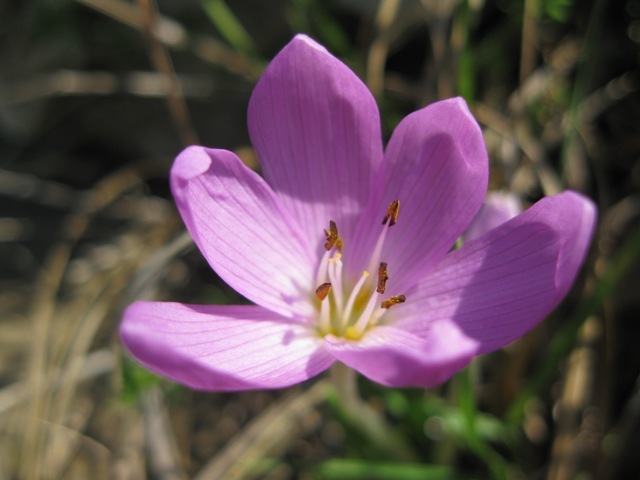 Colchicum bivonae The first plant picture below, grown from wild-collected seed, is an example of the pure species Colchicum bivonae, which is a parent of many of the large-flowered Colchicum hybrids, often in crosses with Colchicum speciosum. 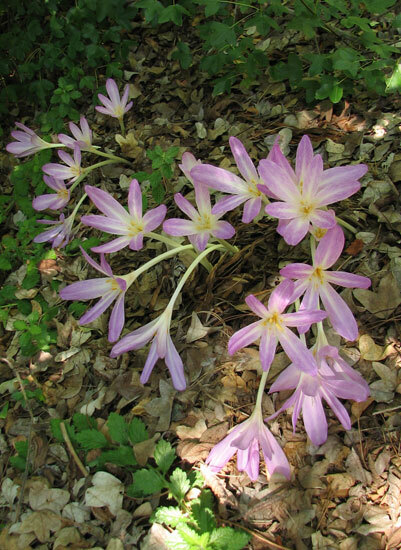 Colchicum bivonae contributes the tessellation (checkering) to these hybrids. 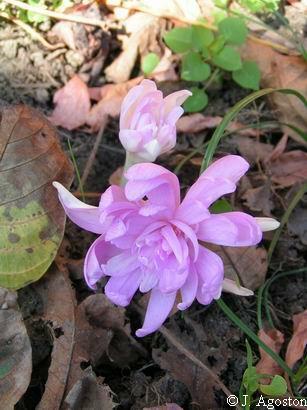 The second photo shows a deep-colored colchicum that lost its label thanks to a flock of crows a few years ago. 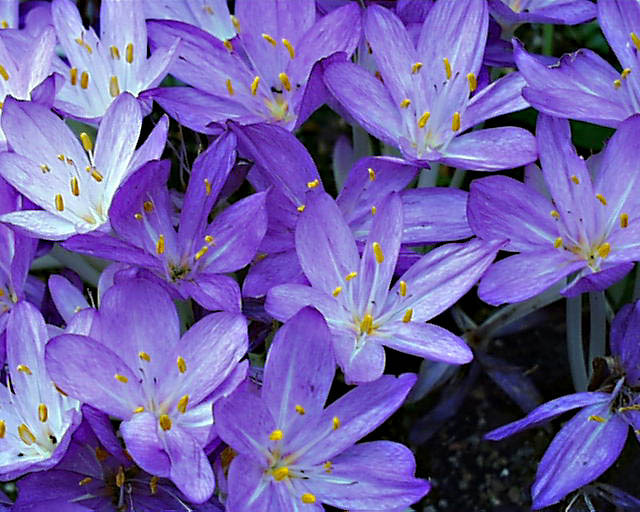 It may be 'Vesta'. 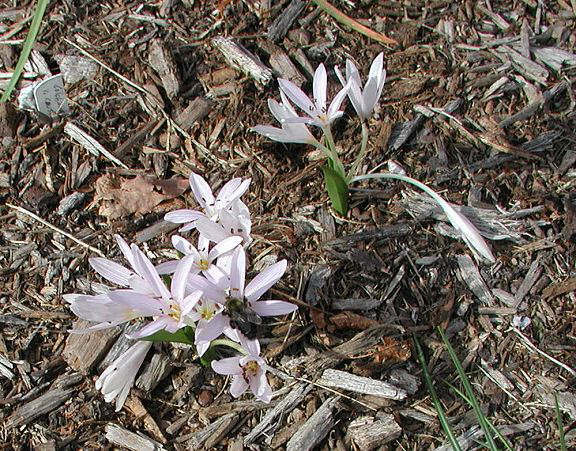 Photos 1,2 by Jane McGary. 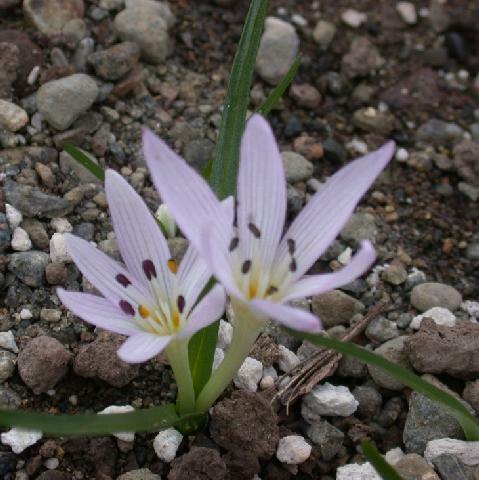 Photo 3 by Bill Dijk. 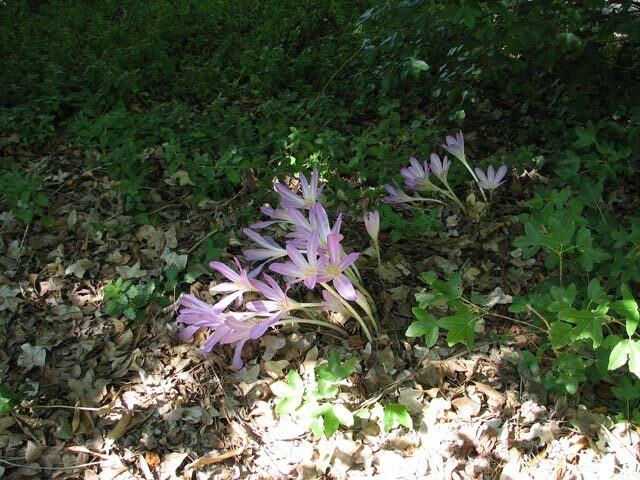 A series of photos in habitat by Angelo Porcelli, in Basilicata - Southern Italy, showing a wide range of forms, with round tepals or pointed, more or less dark and tessellated. 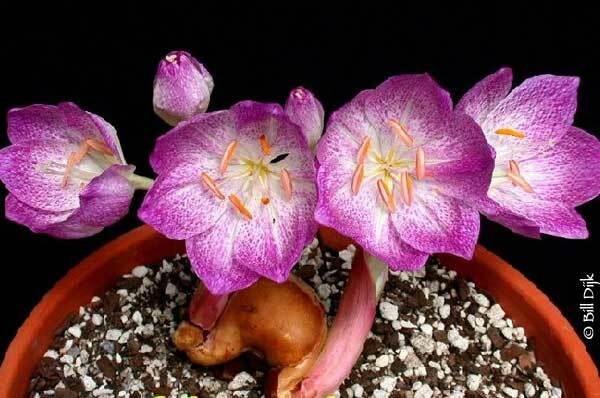 This is rarely seen on the cultivated ones, being usually clones. 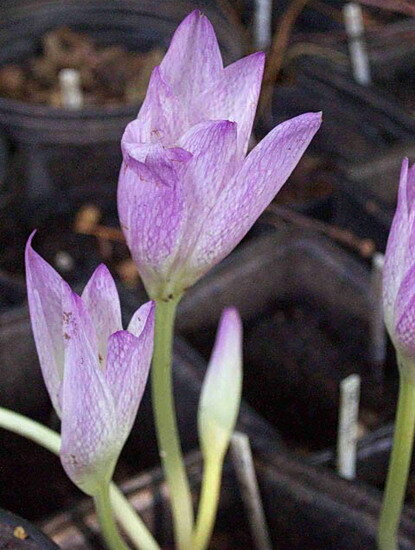 Colchicum bivonae 'Apollo' This handsomely tessellated cultivar seems to be fairly reliable in my Maryland garden. 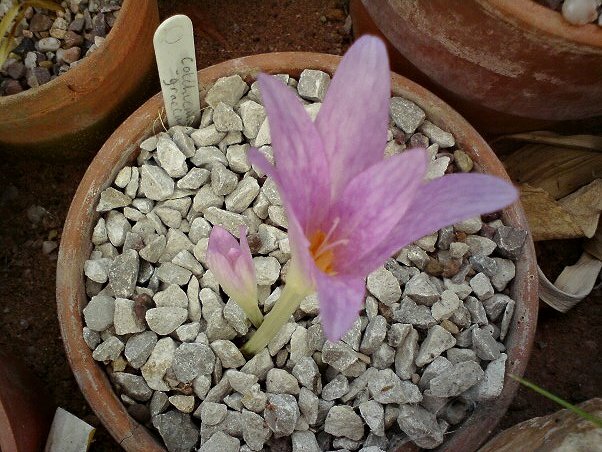 About twenty years ago I received what was probably the same plant under the now discredited name Colchicum bowlesianum. 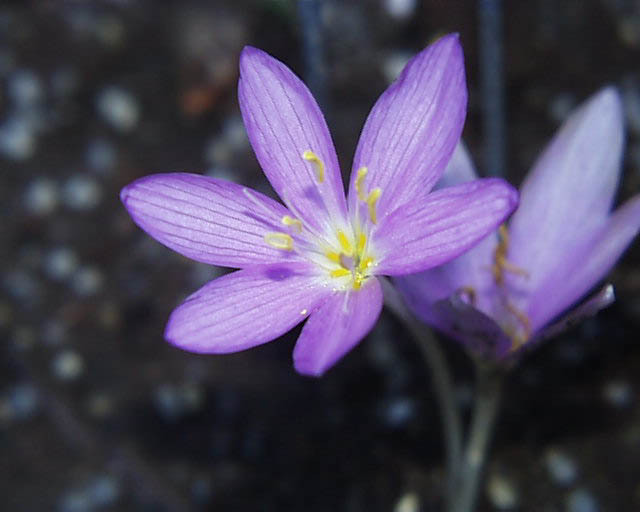 Photo by Wayne Crist of a plant in the garden of Jim McKenney. 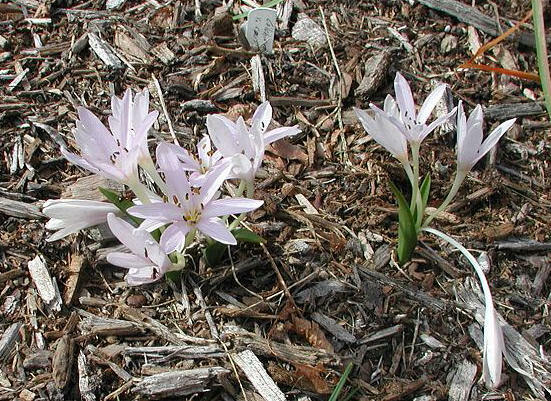 Colchicum boissieri has corms which travel horizontally. 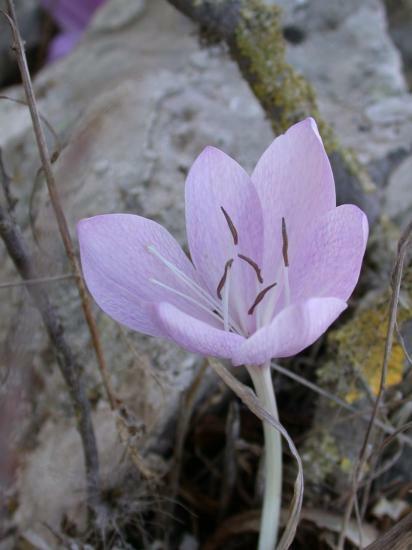 It is found in stony places in Greece and Turkey. 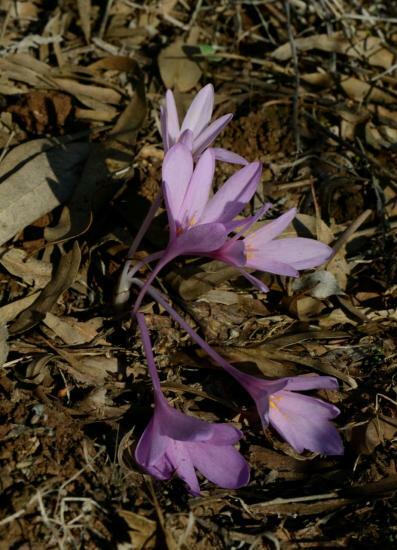 Photo #2 shows this species in the wild on the Mani Peninsula, southern Greece, in late October. 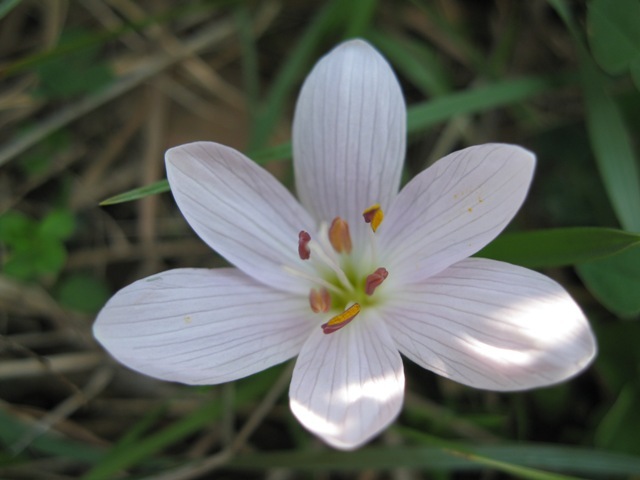 Photos by Jane McGary and John Lonsdale. 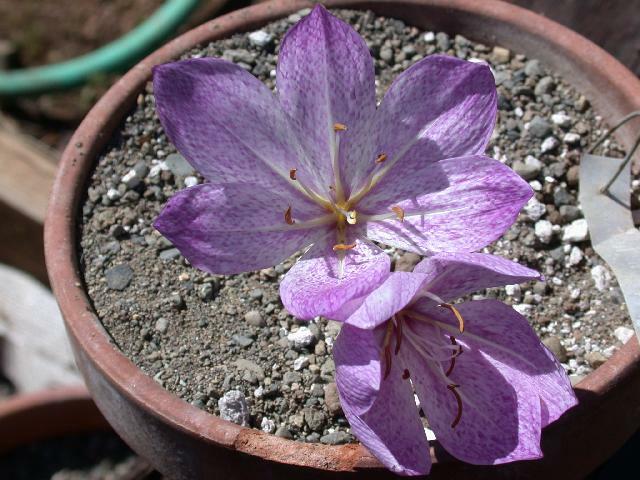 Photos from Mary Sue Ittner are of plants grown in Northern California. 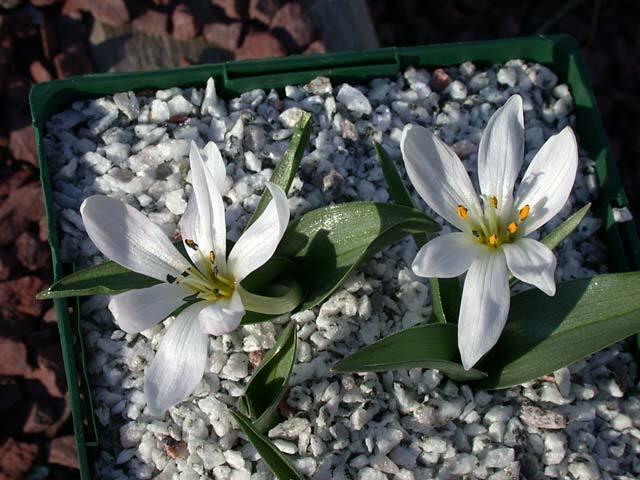 The first three show flowers blooming in October 2011 on an unusually cold day for that time of year they partially open. 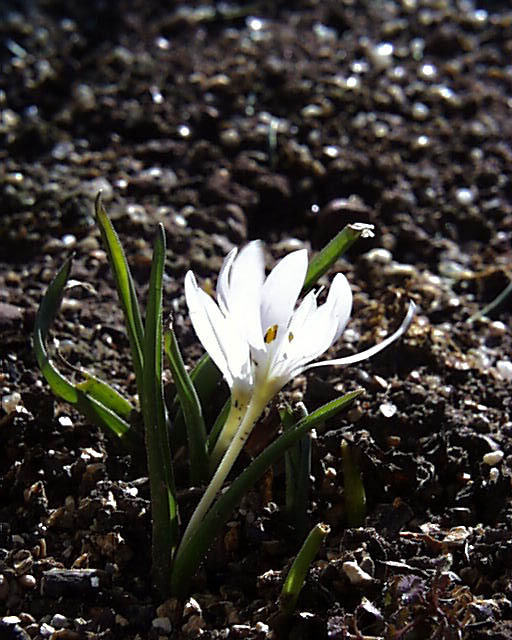 The last was taken on a sunny day several years earlier. 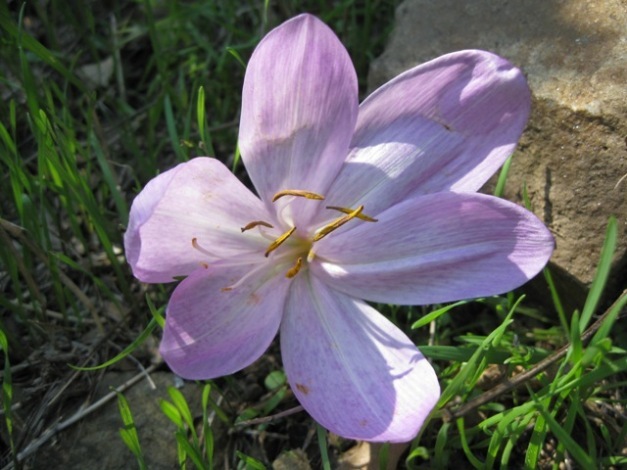 Colchicum brachyphyllum is a species that flowers with the leaves, from Israel. 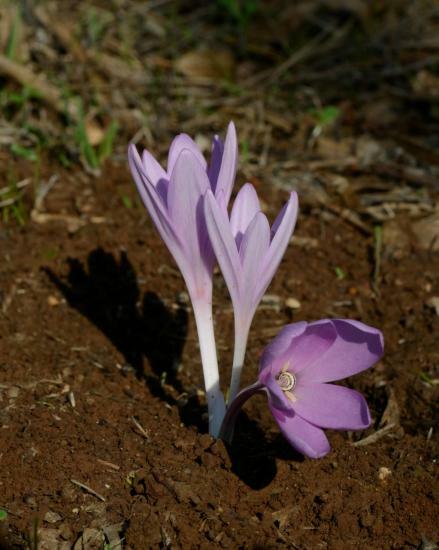 Photos by Gideon Pisanty. 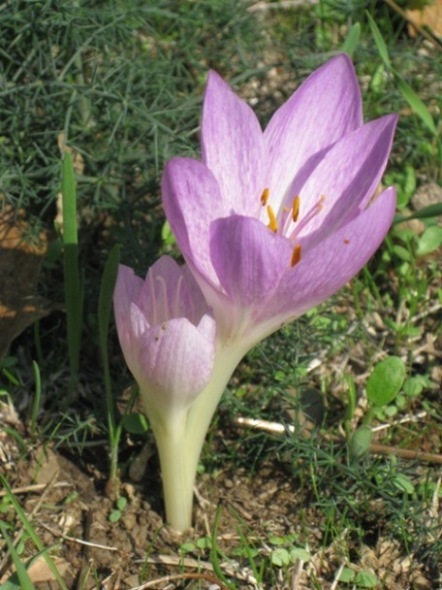 Colchicum cilicicum is another species native to Turkey with pinkish-purple flowers and can be grown in open sunny borders. 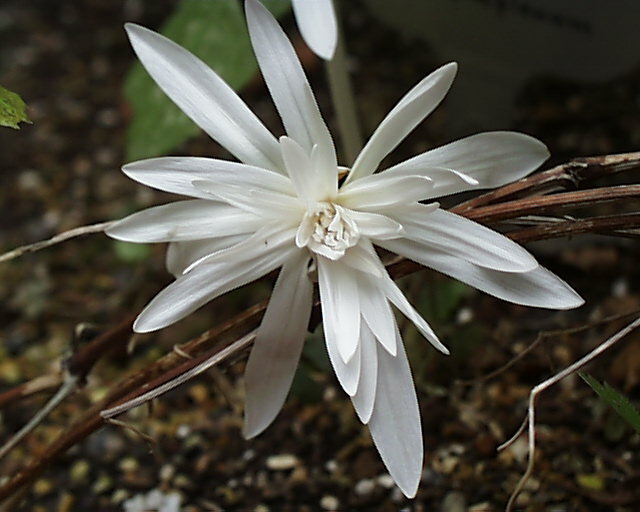 First two photos by Arnold Trachtenberg. 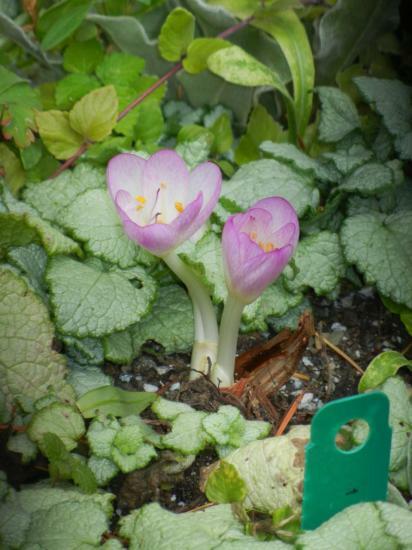 The remaining photos by Travis Owen showing flowers and emerging leaves, where it grows in harmony with deadnettle (Lamium maculatum). 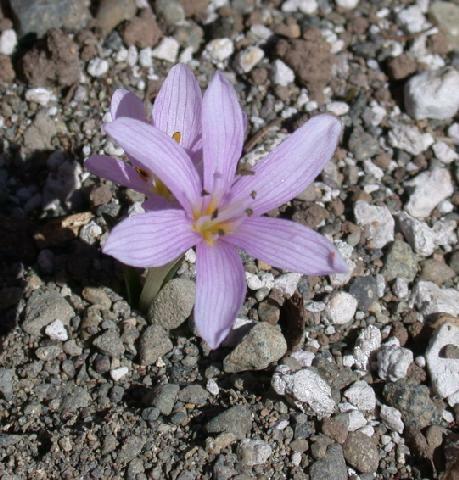 Colchicum cupanii is one of the smaller species, bearing 2-6 flowers and a couple of small leaves at the same time. 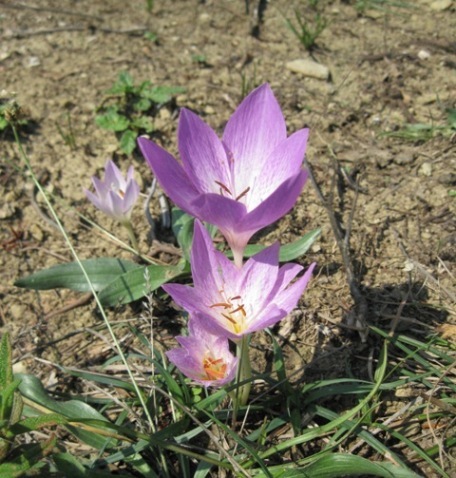 Photos in habitat in Apulia-Italy by Angelo Porcelli, showing colour variants. 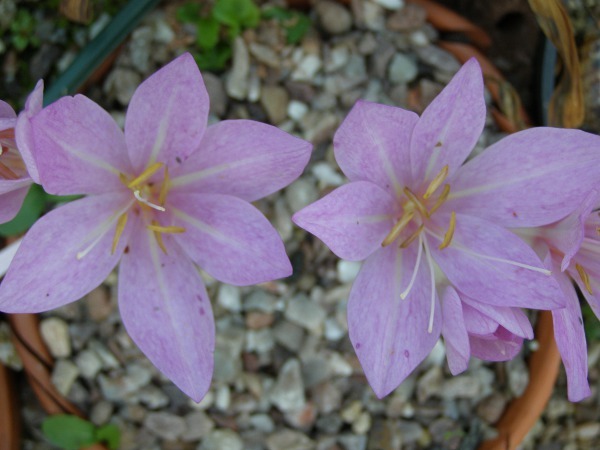 The first two photos below by Mark McDonough were taken on November 13, 2005. 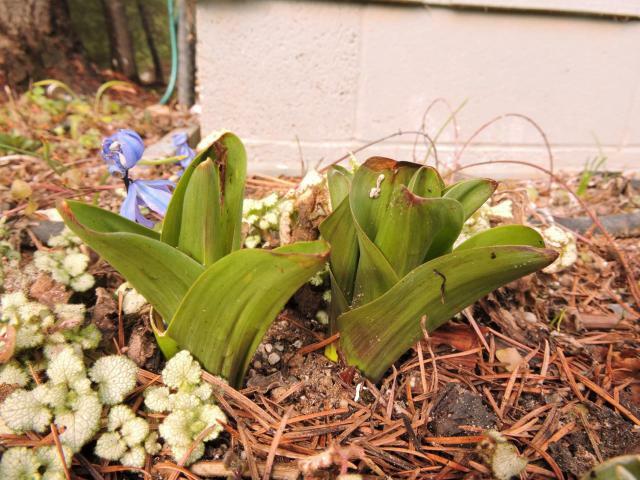 Notice the brave bumblebee in the first photo. 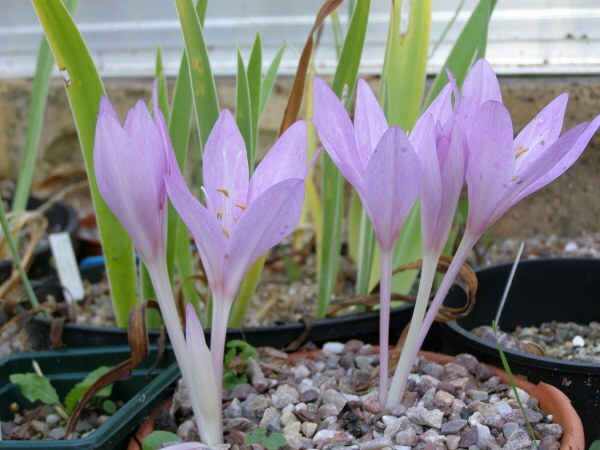 The third photo was taken by John Lonsdale. 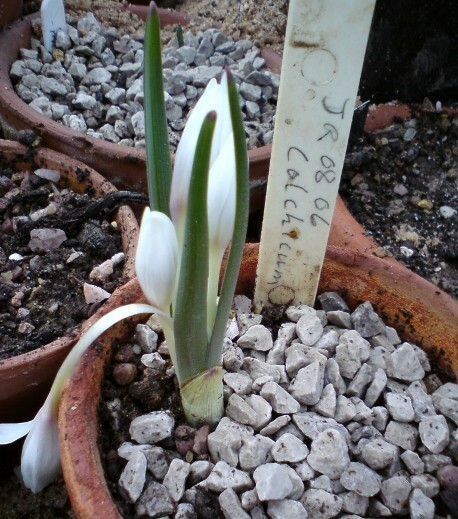 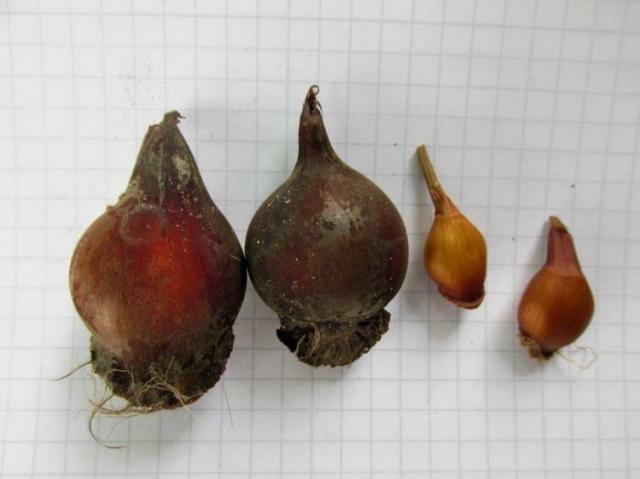 The first picture from Jane McGary is of a form purchased from Monocot Nursery in England as Colchicum cupanii subsp. 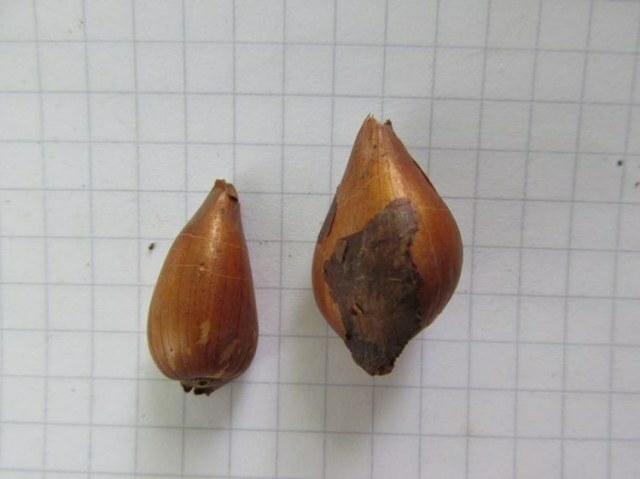 bertolonii. 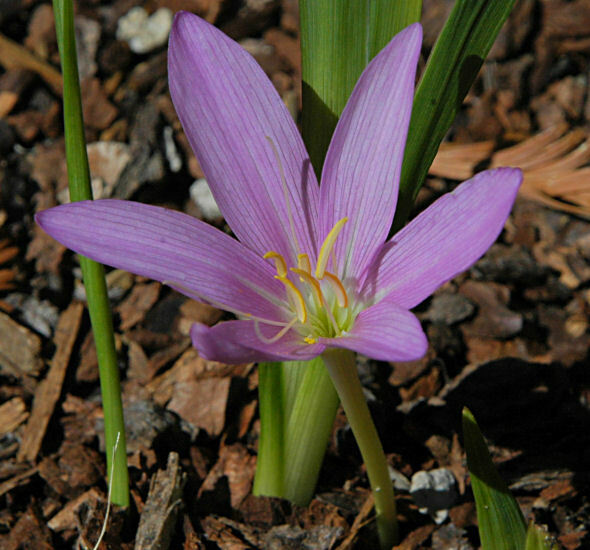 It is an example of the smaller Colchicum species (cf. 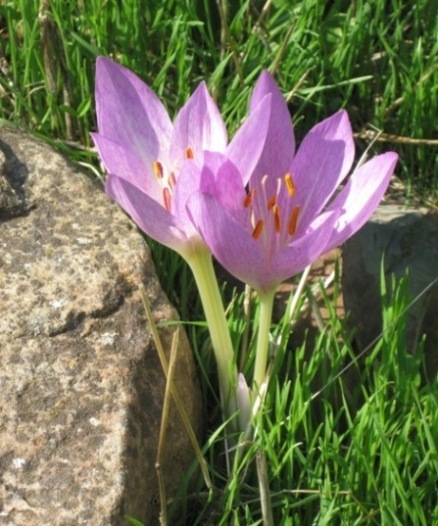 Colchicum hungaricum). 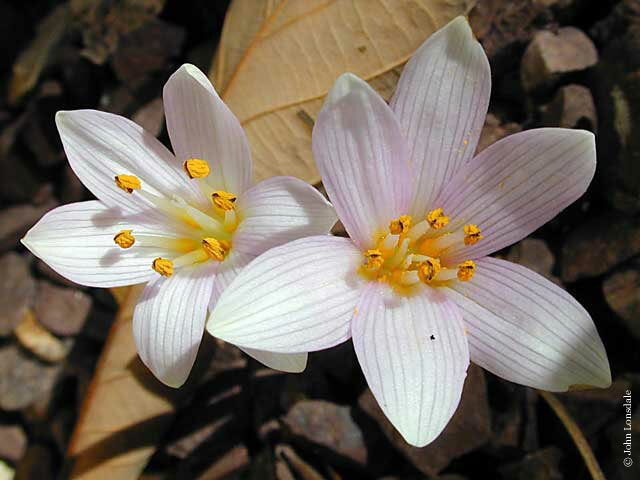 This subspecies is not recognized by all and is considered to be subspecies cupanii by some. 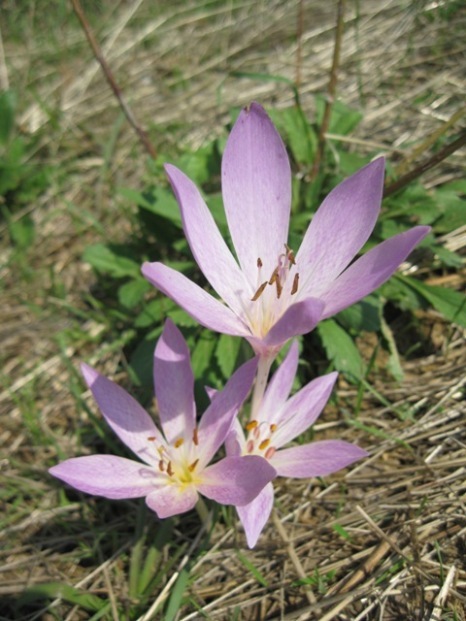 Another synonym is Colchicum bertolonii. 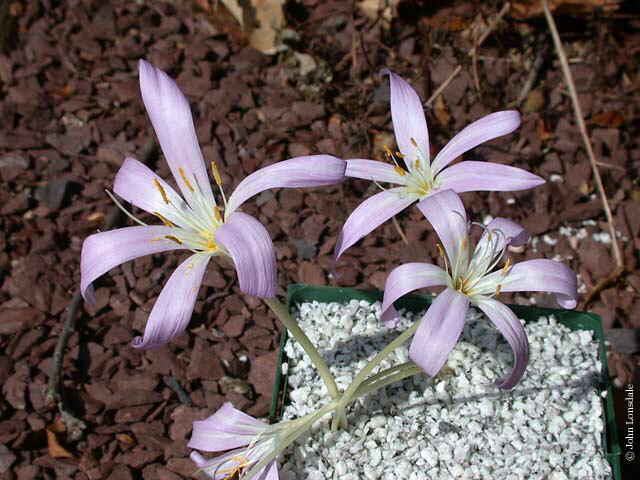 The second photo by John Lonsdale is of another form he received as Colchicum cupanii ssp pulverulentum, another subspecies either not generally accepted or considered to be ssp. 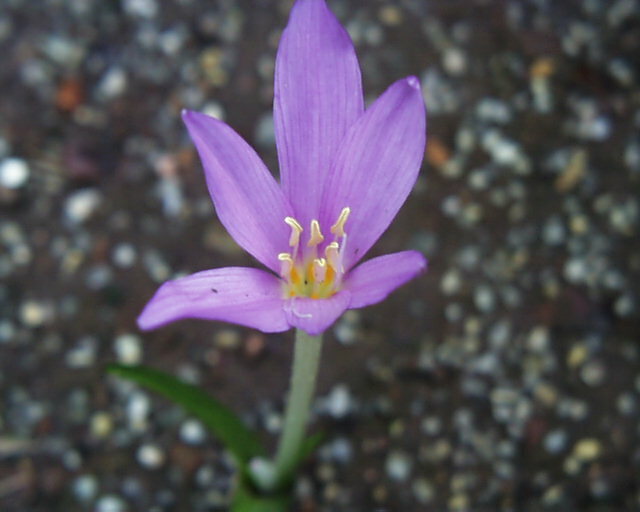 cupanii. 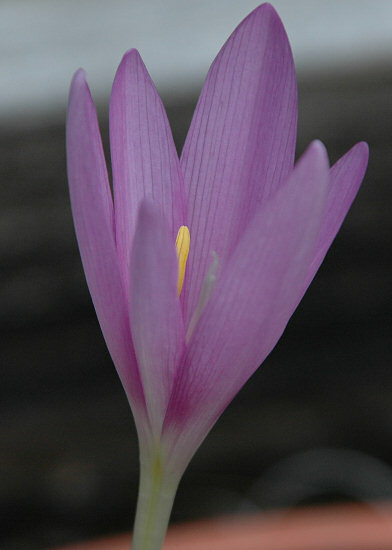 Colchicum feinbruniae K.Perss. 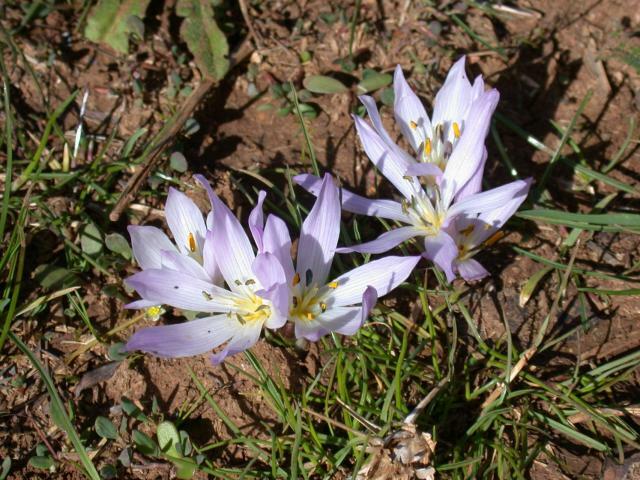 is a fall blooming species endemic to Israel, Syria, and Lebanon. 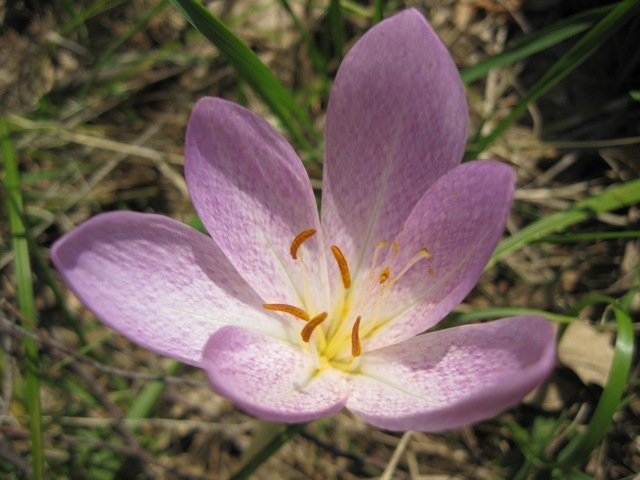 It has pink flowers with a blurred checkered pattern. 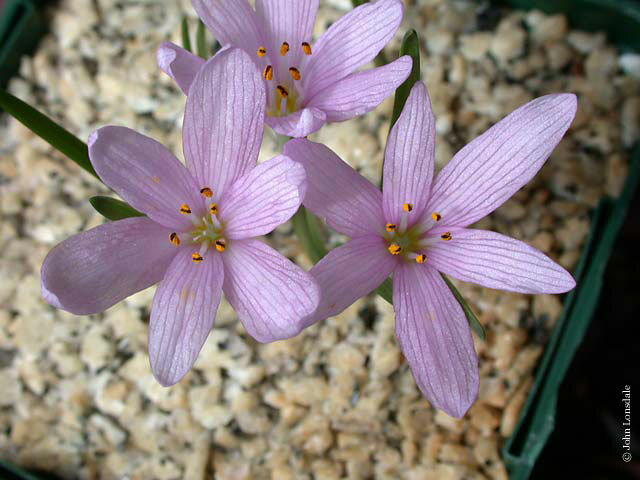 It was named after the late Prof. Naomi Feinbrun, one of Israel's greatest botanists and a world specialist of bulbs. 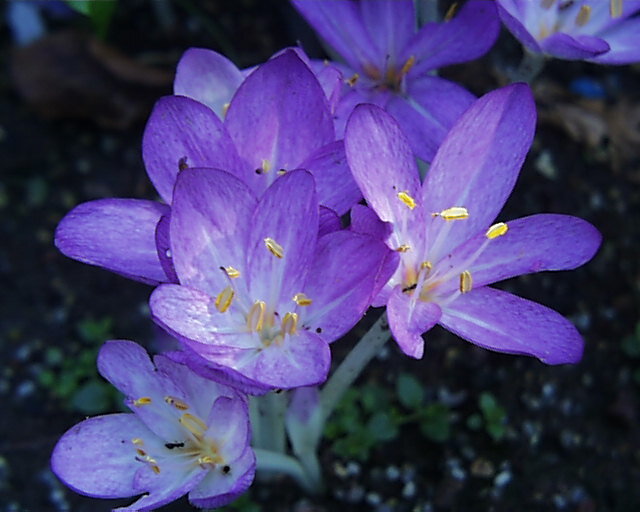 Photos by Peter Taggart. 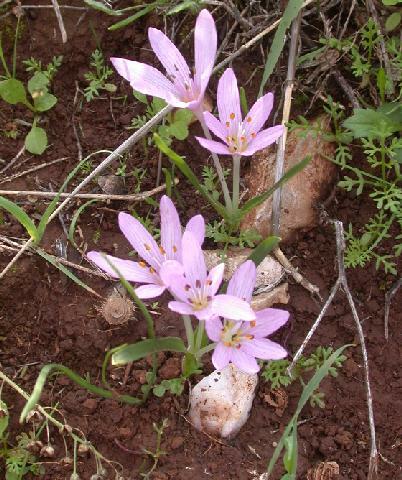 Photos of wild plants in Israel by Gideon Pisanty. 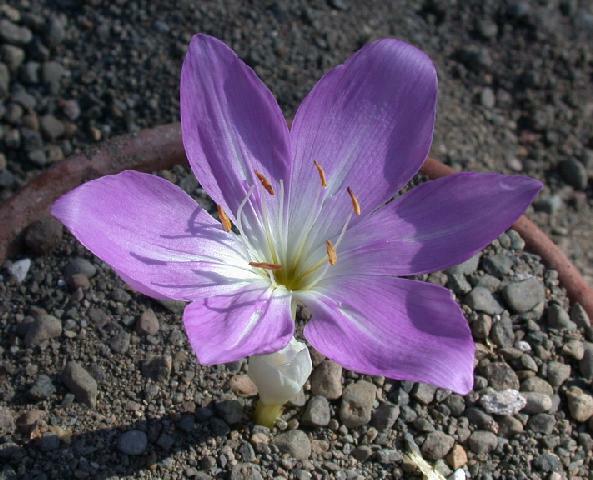 Colchicum glossophyllum is a small species that blooms early. 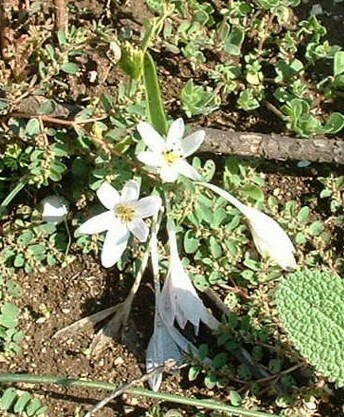 One authority says is a variant of C. cupanii; however, as you can see in the photo, the leaves are much broader and longer at anthesis than is typical of C. cupanii as I have seen it. 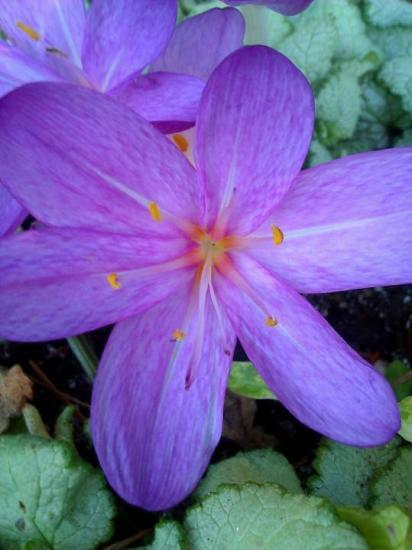 The deep purple anthers are quite striking. 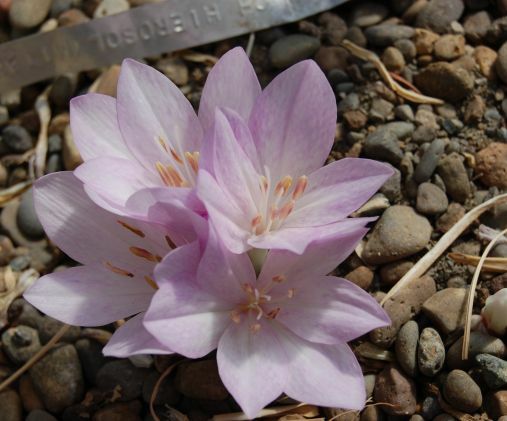 Photos by Jane McGary and John Lonsdale. 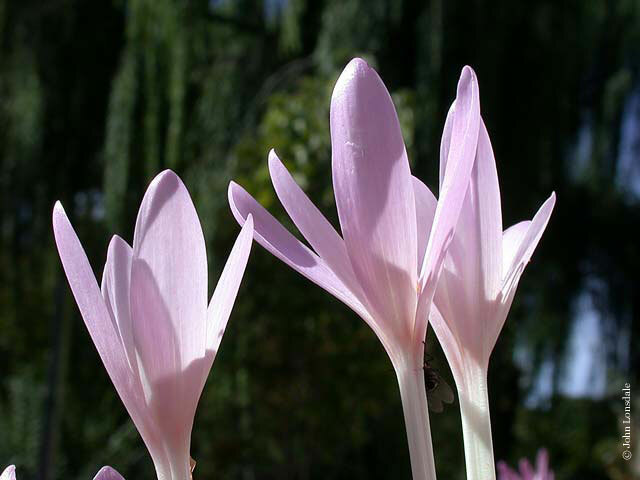 Colchicum graecum K.Perss. 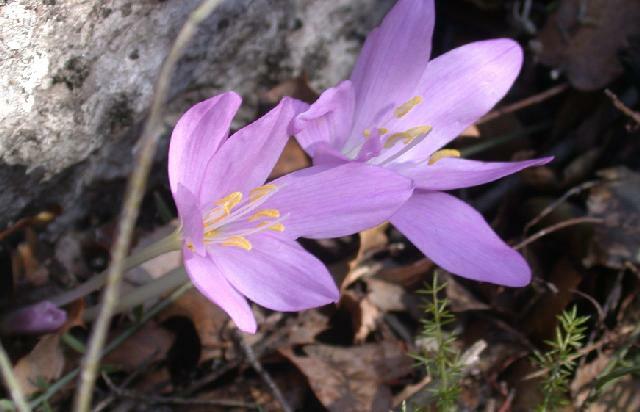 is native to Greece. 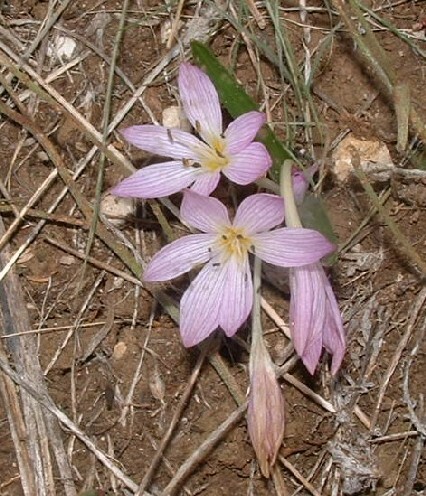 It is an early flowering species with rose pink faintly tessellated flowers. 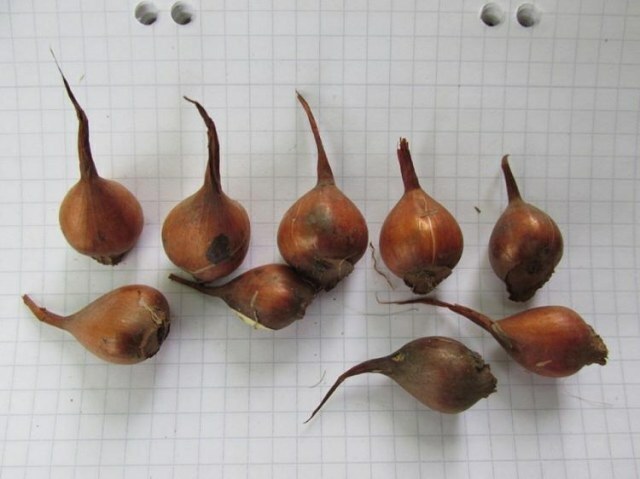 Photo from Peter Taggart. 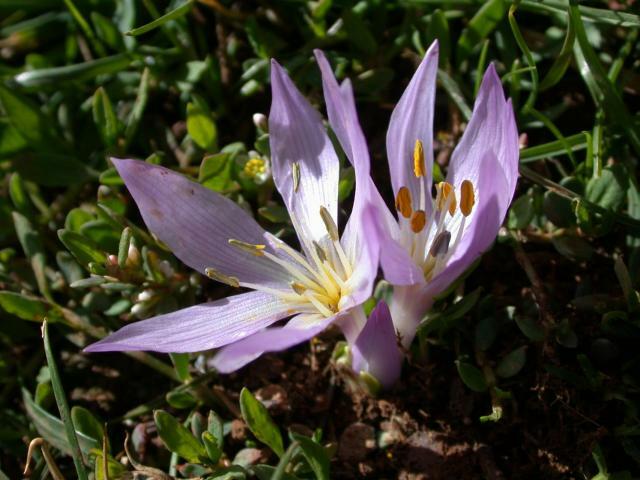 Colchicum hierosolymitanum is a species of moderate size, named for its native region around Jerusalem. 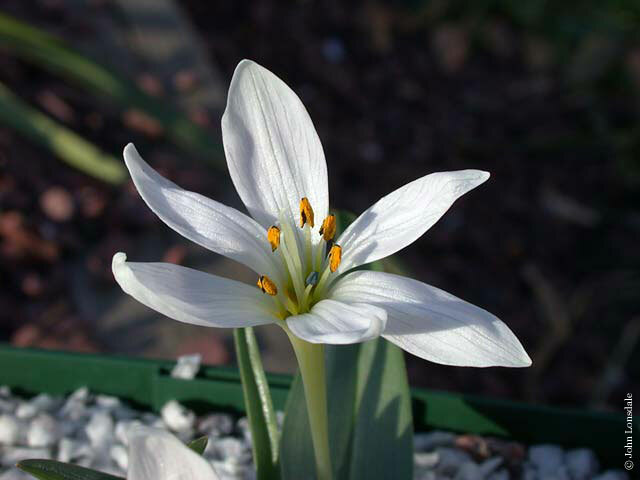 The photographed plant is one of a group grown from seed collected in the wild by Michael Salmon in the 1990. 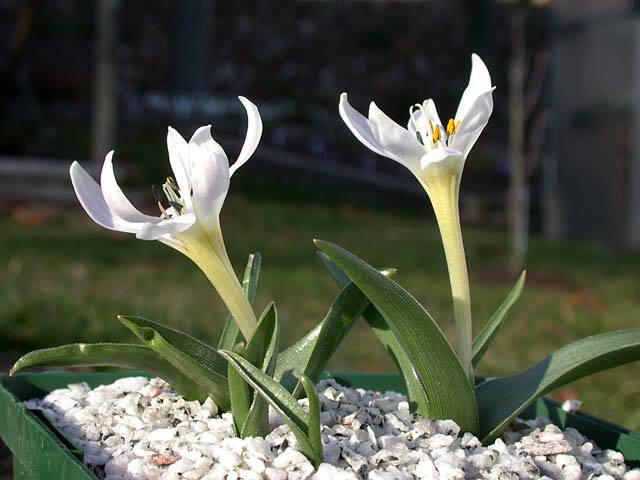 Growing in a roofed raised bed of coarse sand over loam in Portland, Oregon, these plants flower annually in October and often set seed. 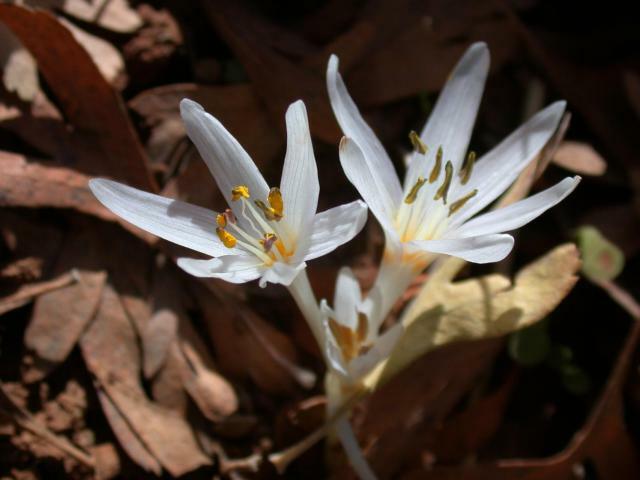 Photo by Jane McGary. 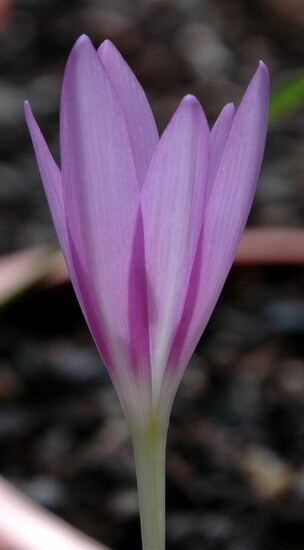 Colchicum hirsutum Stef. 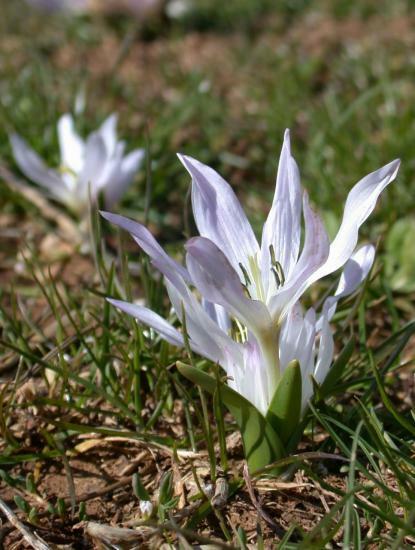 is a species of southeast Turkey that flowers in late winter, early spring. 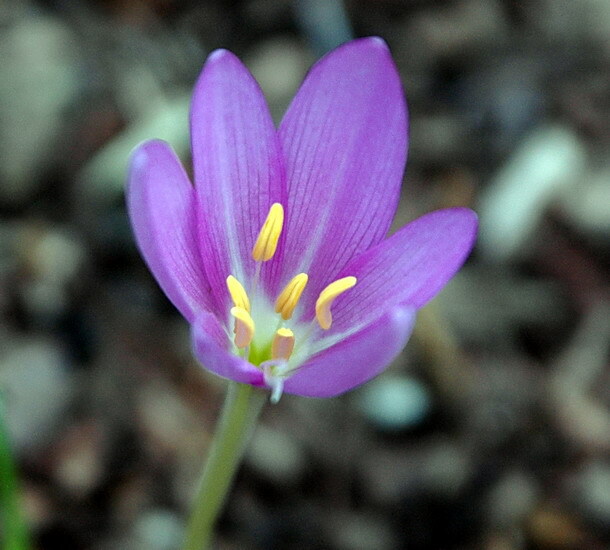 First photo from Peter Taggart. 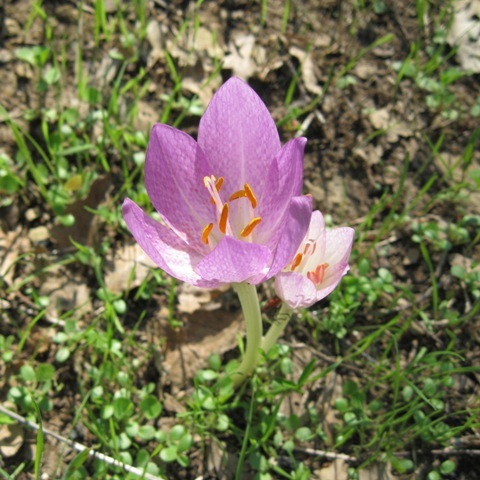 Second photo by Dr. Dimitri Zubov, Turkey. 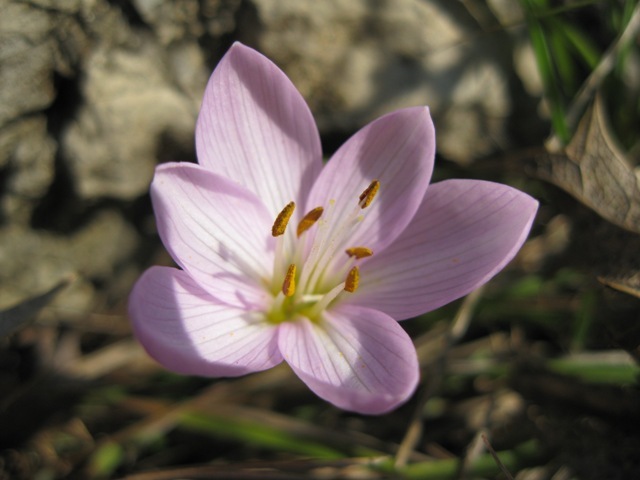 Colchicum hungaricum is a spring blooming species with white or pinkish-lilac flowers. 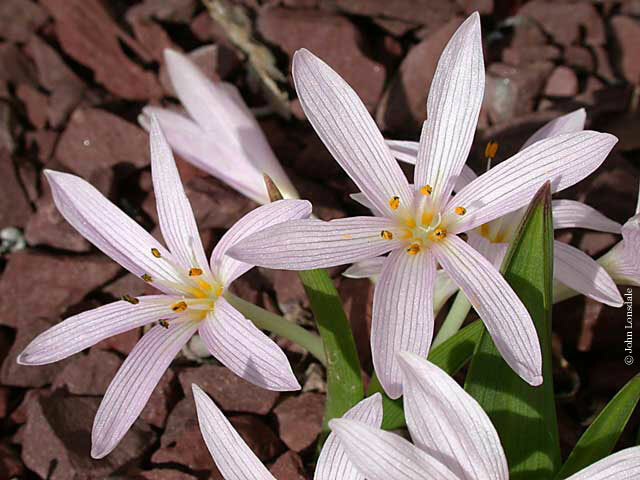 Photos by Arnold Trachtenberg and John Lonsdale. 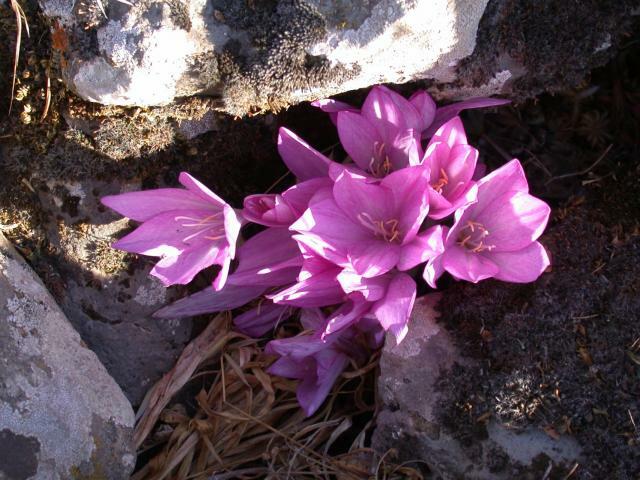 Colchicum hungaricum 'Velebit Star' Photo of corms by Dr. Dimitri Zubov.